Such a delicious tropical thumbprint cookie! 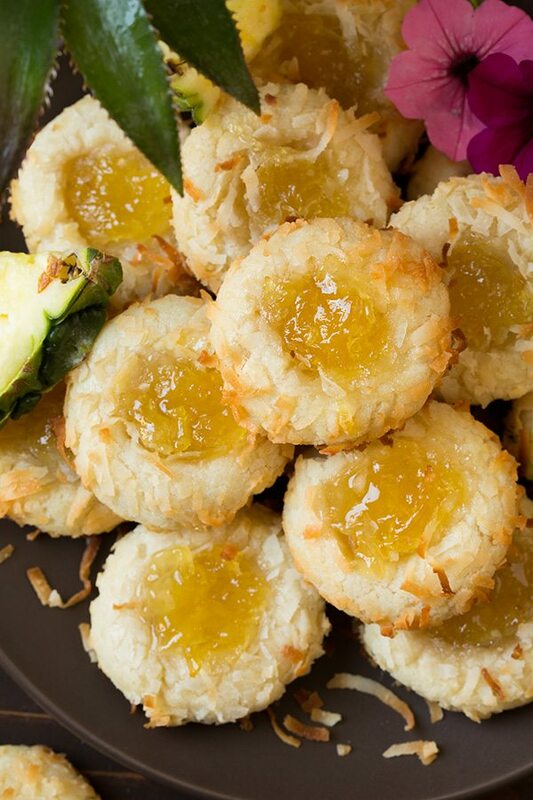 Buttery cookies are rolled in shredded coconut then indented and filled sweet pineapple jam. A treat you’ll love year round and fun to gift during the holidays. 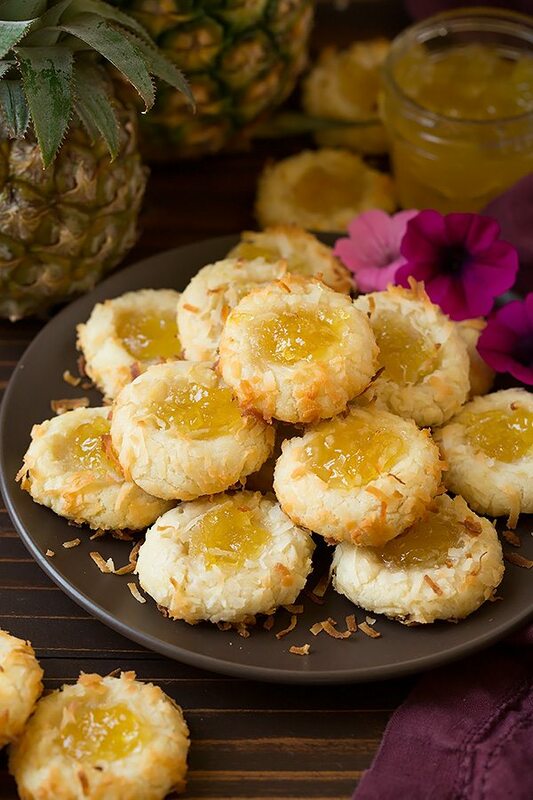 Thumbprint Cookies Pineapple Jam and Coconut! 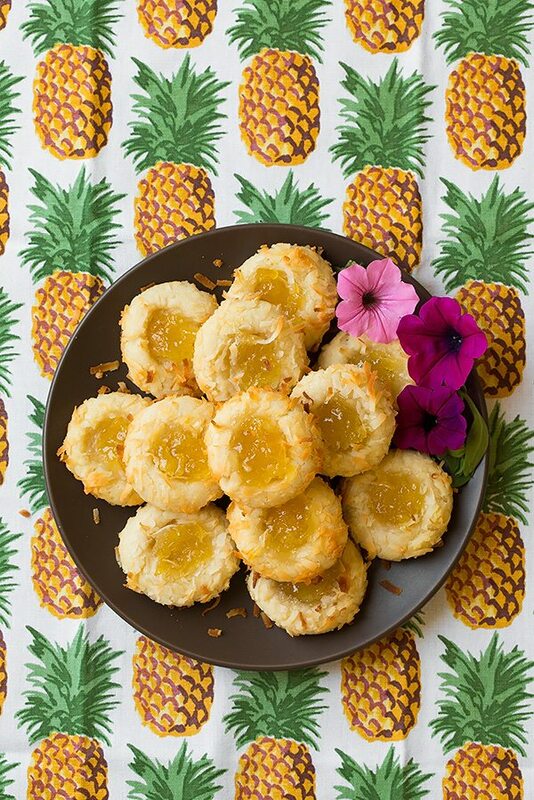 So I didn’t make it anywhere tropical this summer so instead I brought the taste of the tropics home with these utterly delicious, melt-in-your-mouth Pineapple Coconut Thumbprint Cookies! I’m obessed with thumbprint cookies maybe these will complete my collection, but then again maybe not :). 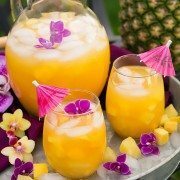 I absolutely love this summery twist on thumbprints! It took a few batches to get them just right but after a little tweaking each time I got them right where I want them. 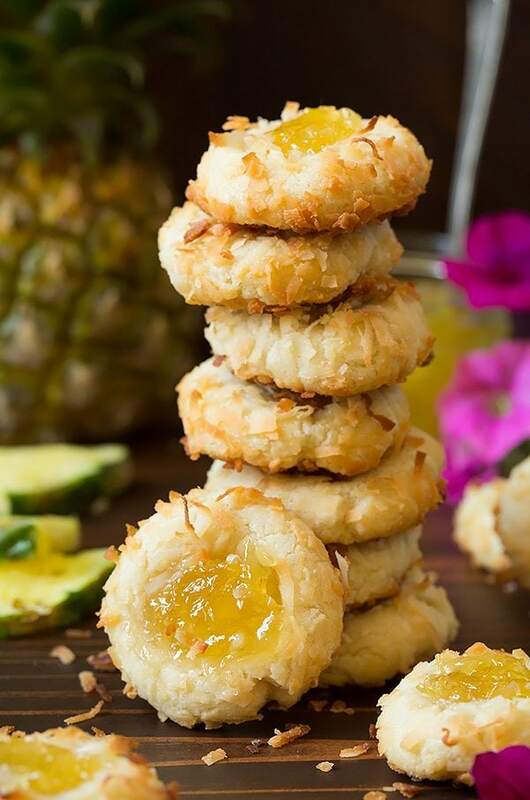 They are perfectly coconuty, deliciously buttery, they have just the right texture, and with the help of a little lemon juice and lemon zest you get a flavorful pineapple jam that makes for the perfect pairing with the coconut. Pineapple preserves – the highlight of the cookies! Lemon (zest and juice) – brightens up the sweet pineapple jam. Shredded sweetened coconut – adds more tropical flavor. Unsalted butter – adds richness. Granulated sugar – to sweeten. Salt – to balance sweetness. Coconut extract – for flavor. All-purpose flour – for the base, won’t work without it. Preheat oven to 350 degrees. Lightly butter a rimmed baking sheet. Mix preserves, lemon zest and lemon juice, set aside. Separately whisk together egg and water until well blended. Add coconut to a separate mixing bowl and set aside. In an electric mixer cream butter, sugar and salt. Mix in coconut extract then flour. Scoop dough 1 tablespoon at a time and shape into balls. Roll each dough ball in egg mixture then in coconut mixture. Transfer to plates and make indentation in center with thumb, then fill each indentation with 1/2 tsp of the preserves. Freeze 10 minutes then remove 12 cookies from fridge at a time and transfer to baking sheet. Bake 17 – 19 minutes until coconut is golden brown on edges. Cool on wire rack. Where Can I Find Pineapple Jam? It was a little difficult to find the pineapple jam where I live, it may be a little easier for you but what I did is just ordered it online (Wal-Marts site to store pick up was free where I live. I used the Smuckers Pineapple). Can I Substitute Another Flavor of Jam? You can definitely substitute pretty much any other flavor of jam here though. I did try them apricot-pineapple jam and raspberry jam and they were also delicious. I think blueberry or peach would also be another great choice, and then of course any other tropical flavored jam you could find. 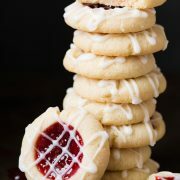 No matter the flavor of the jam these are such a fun cookie that people of all ages will love! Try them soon! 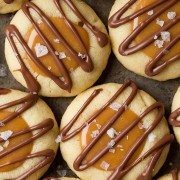 More Thumbprint Cookie Recipes to Try! Such a delicious tropical thumbprint cookie! 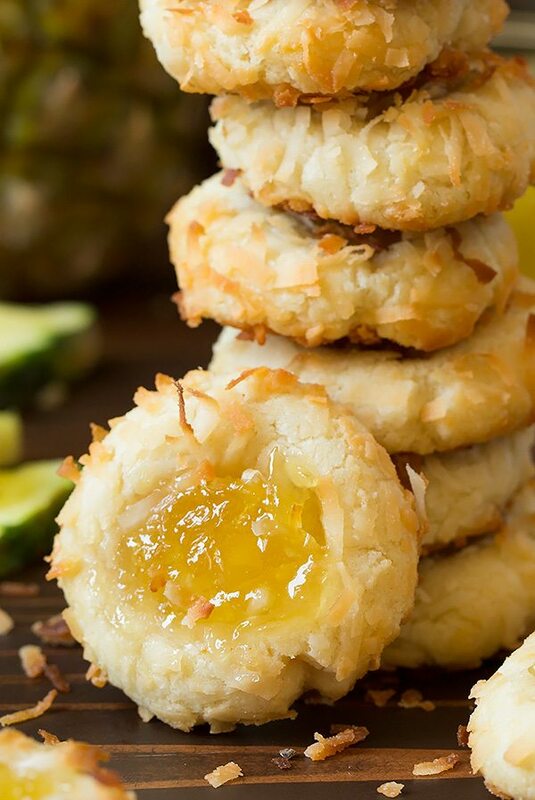 Buttery cookies are rolled in shredded coconut then indented and filled sweet pineapple jam. A treat you'll love year round and fun to gift during the holidays. In a small mixing bowl gently stir together preserves, lemon zest and lemon juice, set aside. In a separate small bowl whisk together egg and water until well blended. Add coconut to a separate mixing bowl and set aside. In the bowl of an electric stand mixer fitted with the paddle attachment, mix together butter, sugar and salt until combined. Mix in coconut extract then add flour and mix until combined. Scoop dough out 1 (even) tablespoon at a time and shape into balls. Roll each dough ball in egg mixture then in coconut mixture (gently press coconut into cookies to help it stick well). Transfer to plates and make indentation in center with thumb, then fill each indentation with 1/2 tsp of the preserves mixture. Freeze 10 minutes or chill in refrigerator 30 minutes then remove 12 cookies from fridge at a time and transfer to baking sheet. Bake 17 - 19 minutes until coconut is golden brown on edges. Cool on pan several minutes then transfer to a wire rack to cool completely. Repeat with remaining cookies. Store in an airtight container.